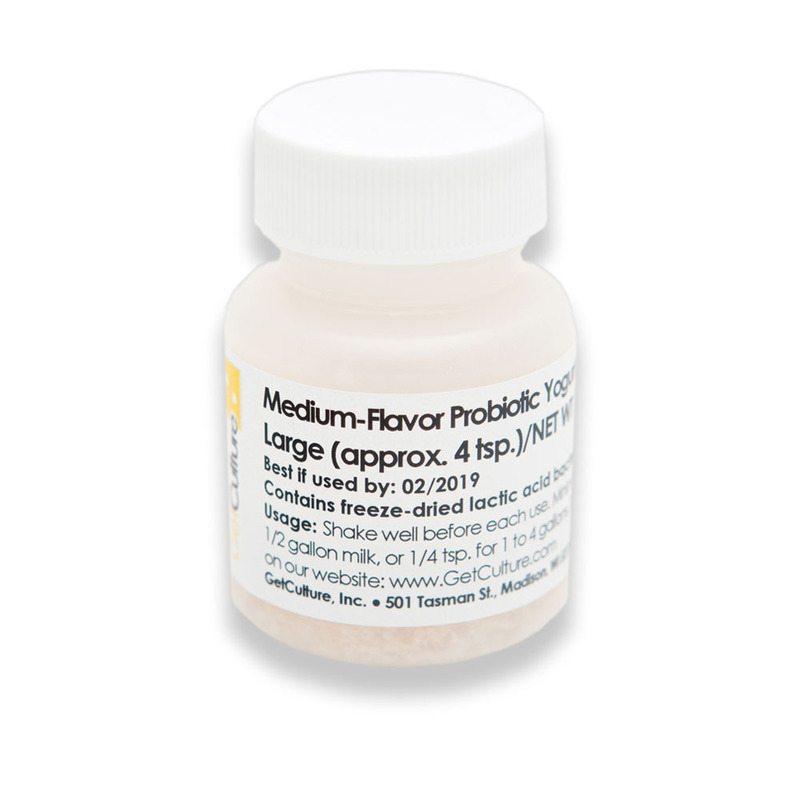 Medium ABY-653 yogurt culture produces a probiotic yogurt with a mildly tart yogurt flavor and medium body. This culture falls between Mild ABY-2C and Tart ABY611 in respect to flavor. Incubate at 106-110ºF. This culture has a 7-8 hour set time when used in pasteurized cow milk. Set times will be somewhat longer in unpasteurized and/or goat milk. Due to the body culture and probiotic cultures, the Medium ABY-653 is not recommended to be recultured because these cultures may not regrow to sufficient levels of benefit or at correct ratios. Can this be used on goats milk? Yes our yogurt can be used with Goat's milk, however the incubation usually needs to be increased. On our website underneath the resources tab you should see available recipes. Under the recipes are instructions for making yogurt, there is a more detailed description of using goat's milk with yogurt culture on the bottom of the yogurt recipe! Is there any reason I can't also make mozzarella with this? I see the difference with the TM 81 would be the addition of probiotics and of course possibly a different ratio of cultures. Would probiotics interfere with cheese making? Thanks. There is no reason why you can't make mozzarella with your yogurt culture. They both contain the Streptococcus and the bulgaricus cultures. The best part of cheese making is the experimentation! How should the yogurt starters be stored? Doesn't freeze-drying kill some of the probiotics? Like all of the freeze dried cultures they should be stored in a refrigerator freezer. Once opened the package should be placed in a ziplock bag or Mason jar to eliminate moisture and again in the freezer. The cultures are packaged based on cell count so the strains are enumerated or counted after freeze drying then packaged based on that count. If some of the probiotics were killed during the drying process they are still packaged based on "live" cell count. A must try! Great flavor and consistent texture. I highly recommend! Excellent flavor - tangy and sweet like a Meyer lemon. Not tart and acidic. I usually use a little cane sugar and vanilla extract with my GC recipe and my kids love it. I bulk it up with nonfat dry milk as per recipe but do not drain. It's got plenty of body and a creamy texture that goes well with granola. Overall, I am very satisfied with the flavor. I've found that I can easily make 3-4 gal of yogurt (I have a oven that can sustain 110 degrees F) that can also be used in yogurt bundt cakes and have a delightful warm citrus aroma that is not a harsh acid.